The response of highly porous powder compacts and powder mixtures to high pressure shock compression loading is of considerable interest for synthesis and processing of metals, ceramics and superhard materials. 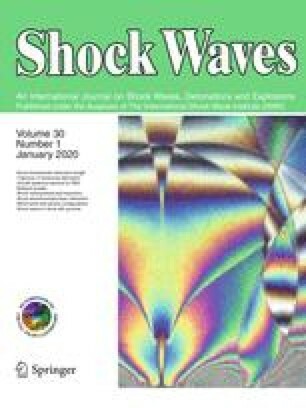 This technical note reports the first successful use of the Bauer piezoelectric polymer stress-rate gauge for measurements of shock wave velocity and stress-wave profiles in porous powder compacts. A powder mixture of 5Ti+3Si shows strong chemical reaction at a pressure of 2.5 GPa, while a powder mixture of 3Ni+Al shows no evidence for reaction at 4.7 GPa. A measurement of compaction of a powder compact of rutile at 5.5 GPa shows that it is not compacted to the solid density state. Although pressure increases due to chemical reaction products in condensed phases are modest and difficult to detect, shock wave velocities provide a sensitive measure of the existence of chemical reaction. The increase in shock speed can be described in terms of constant pressure processes which are descriptive of “ballotechnic” reactions, i.e. shock-induced reactions in heterogeneous material mixtures. This article was processed using Springer-Verlag TEX Shock Waves macro package 1.0 and the AMS fonts, developed by the American Mathematical Society.